Kurt Russell, Wilford Brimley, T. Poster artwork by Drew Struzan. Size: 27 x 41 inches (68.58 cm x 104.14 cm). Condition: near mint-mint and unused. 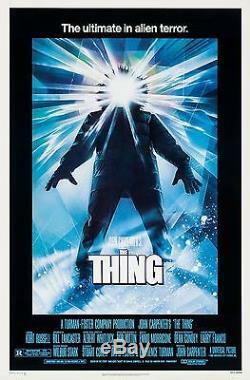 The item "THE THING (1982) ORIGINAL MOVIE POSTER ROLLED DREW STRUZAN ARTWORK" is in sale since Thursday, October 11, 2018. This item is in the category "Entertainment Memorabilia\Movie Memorabilia\Posters\Originals-United States\1980-89". The seller is "moviepostercenter" and is located in California. This item can be shipped worldwide.